This article requires the Real Player. Press the button to get the FREE plug-in! I almost made a mistake when reviewing this album. I (and I'm sure many of my colleagues) may have compared Ms. Estefan's gloria! with Donna Summer. I will be the first to admit that on many tracks her performances are reminiscent of Donna, however Ms. Estefan is no imitation. The similarities are because the writers and producers were mirroring the styles of the late Paul Jabara. Paul Jabara was a gay songwriter and producer that penned many dance classics including, "The Main Event" for Barbara Streisand, "Take Me Home" for Cher, and "It's Raining Men" for the Weather Girls which he co-wrote with David Letterman bandleader, Paul Shaffer. He is most known for his work with Donna Summer including: "No More Tears (Enough is Enough)" (duet with Barbara Streisand) and "Last Dance" from the movie, "Thank God It's Friday" which earned him the 1978 Academy Award for Best Song. He was in the original Broadway cast of 'Hair', released recordings as a solo act and scored a few films. Jabara's style was high energy and utilized big orchestrations with lush string arrangements. Most importantly, Paul Jabara is credited with conceiving and distributing the first Red Ribbon. He died from complications from AIDS. His death marked the end of an era, as producers utilized technological advancements to produce a bigger sound. I predict every club DJ will be playing more than one track from this collection. Few releases have its high production qualities while keeping the focus solely on the dance floor. 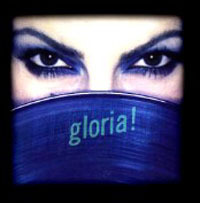 This self titled album 'gloria!' does exactly that effortlessly and Ms. Estefan rises to the challenge. One reason may be the level of musicianship is outstanding. Gloria's status allows her the freedom to utilize, as many musicians needed to paint a large canvas. Her concerts are major productions and she's used to taking a big sound with her wherever she goes. It's natural to assume she would want to have the same fullness in the studio. To achieve the diva status, a vocalist must consistently prove in a variety of settings her ability. One is not born a diva; it comes only with experience. Vocalists are also judged on subtlety, nuance, as well as the appropriateness of delivery for the track in question. Gloria Estefan has long ago achieved this status, as evidenced by her association with Quincy Jones, (he is the godfather of one of her children). On 'gloria!' each of her performances excels on this assorted offering while further documenting her status. She knows when to turn it up, and when to create dramatic tension. And like a true diva, she is comfortable to let the other musicians around her shine. In fact she has been referred to as the 'Queen of Nice'. The horn section attacks furiously with their tongue attacks on 'oye' [ stereo / mono ]. On 'heaven's what i feel' [ stereo / mono ] the strings are Jabara-esque in their lush intensity. She embraces her Latin heritage with percussion on 'cuba libre' [ stereo / mono ]. In fact, it is her unique infusion of her multi-cultural background that defines her style. If America could learn that only by accepting our multi-cultural diversity, can we truly excel. Thanks to my friend Craig (Gloria's sound man) I was invited to her last concert in Philadelphia. Usually she hangs around backstage to greet the press and special fans, but that night was special. She reserved the green room for a delegation of nuns who taught her when she was younger. She even introduced them during the show. However, the diva made sure to take time out of her busy schedule to autograph a photograph for the GALAEI Project an AIDS service organization in Philadelphia. She sent word that she was sorry we didn't have a chance to talk, however I was allowed access to see where Craig worked. I was also given an opportunity to discuss one of my favorite subjects, music technology with her keyboard manager -- I had a blast!!! I told you she's the Queen of Nice. Special thanks to John Shirley and Jonathan Vendrick for their contributions to this article.